I’ve always been fascinated with the strange, the uncanny, and the darkness in people. That fascination has something to do with my desire to explore—and eventually triumph over—that darkness. A friend of mine, who knew Mina V. Esguerra, sent me a link to a call for submissions for a crime anthology and workshop, #HeisClub. I have read and loved Ms. Esguerra’s works, so I was pretty excited to contribute my own story. The fact that it was a crime and mystery class only added fuel to the flame. 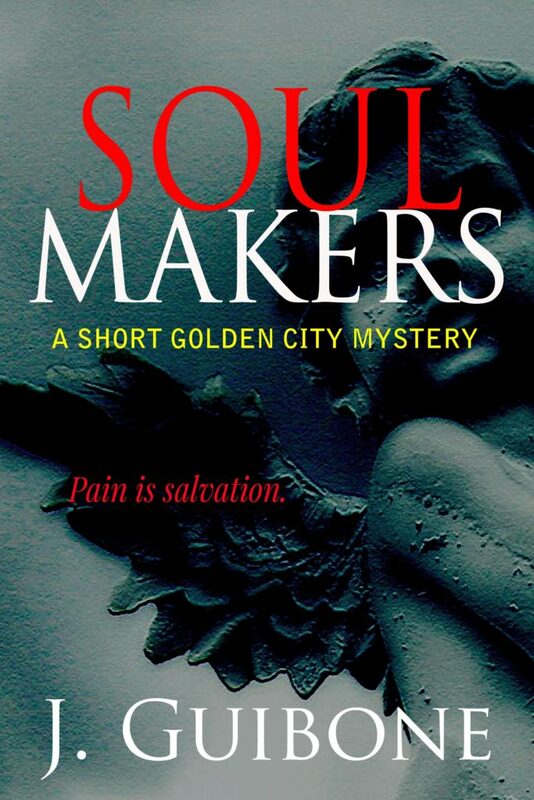 Soul Makers, which is the first story in the Golden City Mystery series, is set in Cagayan de Oro City (hence the title). Its primary characters are Sabrina, an obsessive-compulsive college student, and Lyla, a strong-minded investigator who thinks the former is more than she seems. The story was primarily inspired by the TV show Criminal Minds and F.H. Batacan’s Smaller and Smaller Circles. It can’t be denied that we people are always interested in things that we don’t fully understand, in things that are not considered normal. Serial killers aren’t considered normal, so they are a staple in crime fiction. I wanted to write about them, about people who could commit such cruel acts—and have them meet their match. I also wanted to explore writing about characters who work together but who have opposite ideas about justice. During the #Heist Club classes, I learned from Kevin Uy, Jennifer Hillier, R.J. Taduran, and F.H. Batacan herself, among others. They taught me that crime fiction isn’t just about the crime. It’s about the victims, the criminals, and the people trying to stop them. When a serial killer roams the streets of Cagayan de Oro, Sabrina gets involved because of her best friend. She battles her own demons and has a grim view of the world. I’ve only teased Sabrina’s history in Soul Makers where she pursues the killer and takes matters into her own hands. The other side of the coin is, however, Lyla, a special investigator from the NBI who takes her job seriously when it comes to bringing criminals to justice. I wanted these two characters to present the different aspects of justice—and vengeance. Vigilantism is a very gray subject—primarily because of fictional characters like Batman. He is my favorite superhero character but I don’t forget that he is largely a vigilante. He works with the police, sure, but he does his own investigations and goes after perpetrators on his own. There have also been times when Batman had gone crazy and beat up criminals out of anger. When it comes to keeping the citizens of Gotham safe, Batman follows no laws but his own. I wanted to bring this issue into my work, Soul Makers. Aside from solving puzzles, I wanted to present my readers a look into how different people aiming for justice can go about it in completely different ways. Although I had been writing stories (many of which are still stuck in my computer in the meantime), I hadn’t attempted to write crime fiction. Ms. Esguerra’s #HeistClub was a great opportunity to try my hand at a genre I have always been interested in and have long been reading. I didn’t fashion Sabrina completely from another person in my life, but she does have characteristics from my friends and me. One thing I share with her is my slightly cynical view of people, which is only tampered by my optimistic view of life. That probably sounds weird—being both cynical and optimistic, but it’s true. The saying that comes to mind when I try to explain this oxymoron is, “Hope for the best; prepare for the worst.” Perhaps it’s because of all the negative news I used to consume—killings everywhere, pollution, ice melting, bees disappearing, illegal poaching, etc. These things constantly make me feel like there’s no hope for mankind and that we, as a species, will destroy ourselves. I feel this regularly, despite experts saying we live in the most peaceful time in human history. And then… there are inspirational stories about people racing against time to save endangered species, rescuers who rush into war-torn areas to save people, journalists who give their lives for the truth, law enforcement officers who help the innocent, and civic leaders who pursue justice amid threats from powerful enemies. All these things make me hopeful that, despite our self-destructive tendencies, humankind will protect the world. It is this uphill battle between good and evil, between justice and vigilantism, that is at the center of the Golden City Mystery series. Ultimately, every story is about hope. The question is whether you get what you hope for in the end. All writers have a theme or a message in whatever story they write—whether it’s a social commentary or an exploration of the future.